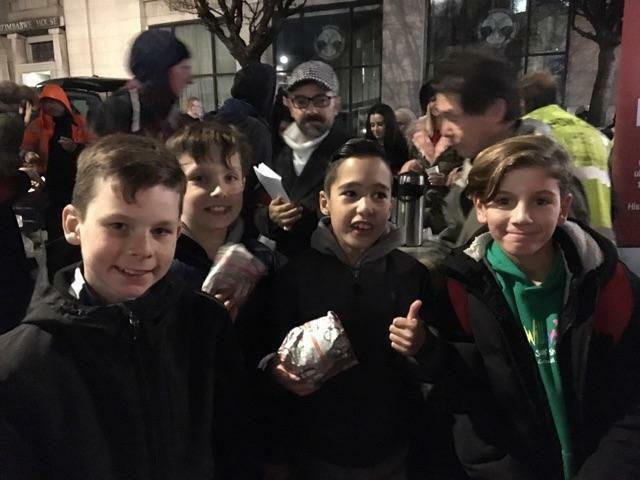 Travis and 3 friends from BWI year 6 – Oscar, Lewis and Jack, embarked on their epic adventure to deliver gifts to homeless people in London. 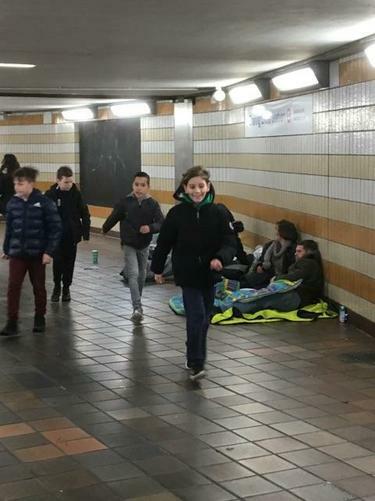 Their journey started at Marble Arch around 2:30pm where they delivered their first present to a homeless lady , this was the start of what was about to be a very rewarding and indeed challenging afternoon for the boys. The journey took them along Oxford Street , Carnaby street , Piccadilly circus , Leicester Square , Trafalgar square and on to Charing Cross. During the 5 hour endeavor they had to battle Christmas shoppers in the thousands , SantaCon ( hundreds of people dressed as Santa who embarked on Trafalgar SQ and cold rainy conditions. 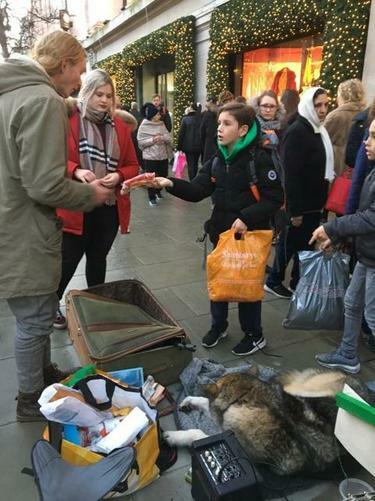 The boys met many homeless people ( some with dogs and a cat) along the way and the comments from the boys continuously was how appreciative everyone was to receive a gift. They had Christmas shoppers stopping in their tracks to watch and admire the great work of the boys , with some stopping to praise their efforts. 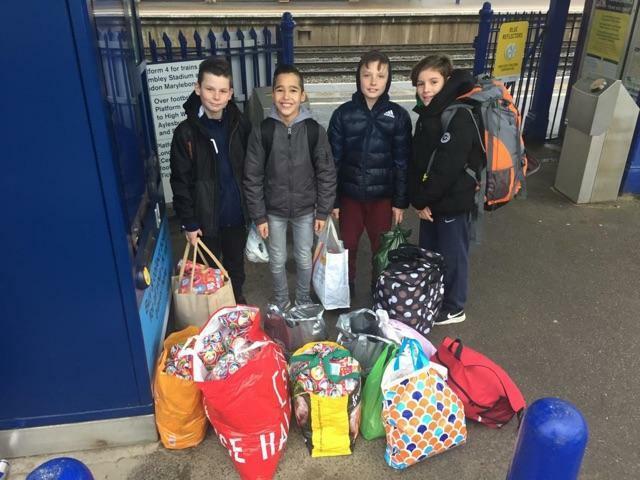 Despite the weight of the rucksacks and carry bags not one of the boys ever complained they were tired and they soldiered on through the afternoon. 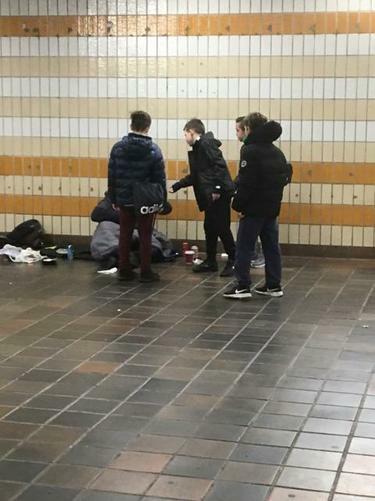 Their hard work paid off when they stumbled across a volunteer soup kitchen setting up outside Charing Cross station , here they met a crowd of homeless people who were lining up to get some food and a warm drink and were fortunate to meet the boys with a big smile ready to hand them presents. Needless to say the majority of the over 300 donated presents were distributed. 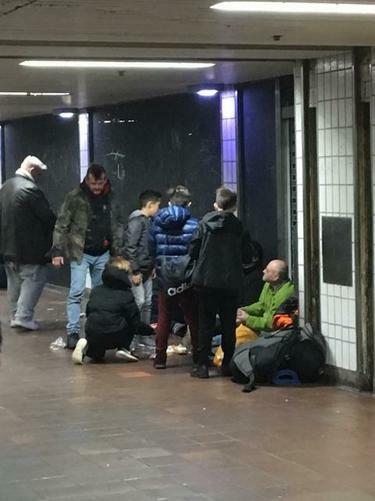 The four boys ended their day with one last stop to a homeless man and his dog on the Strand whom Travis had met before to give him and his dog their last presents. Tired and cold they called it a day around 7:30pm and headed home to get some much needed rest. Below are some pictures of the boys in action. Thank you to everyone from the school community who donated hats , scarves , gloves and socks to this fantastic initiative. Everyone’s support and generosity has truly surpassed expectations.